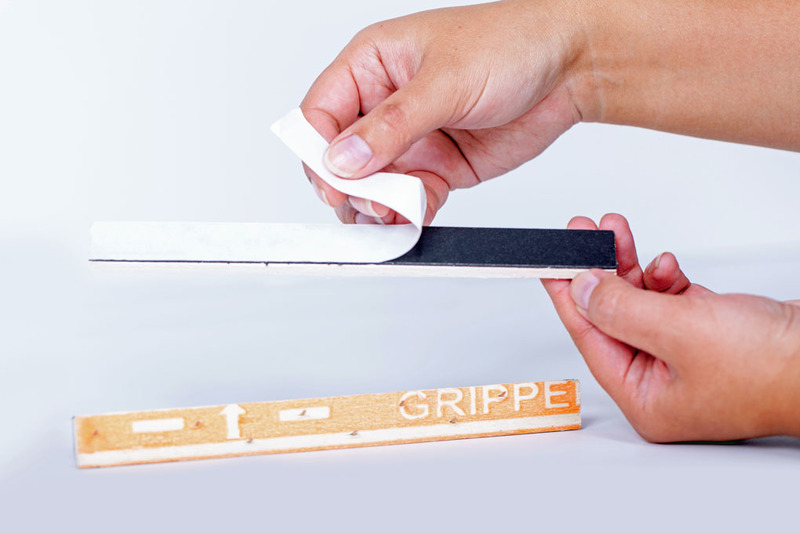 Gripper Edge Peel & Stick - Jona Panel Sales Inc. - Jona Panel Sales Inc.
Gripper Edge Peel & Stick tack strip is revolutionary yet simple to use. Simply peel away the protective paper underneath the tack strip and stick to a clean surface such as cement, plywood or even tile. Jona Panel Sales Inc. offers a limited lifetime warranty guaranteed to last the lifetime of the carpet. In fact, the longer the Gripper Edge Peel & Stick tack strip is stuck to a surface the stronger the adhesion becomes overtime. Clean substrate thoroughly. Scrape up paint, drywall compound, other materials stuck to substrate. Vacuum or sweep thoroughly. Install a short test strip. Check for grip. If strip releases, substrate is not clean. Sweep/vacuum again. Peel off the paper and apply the strip with pins angled toward the wall. Leave a gap appropriate for the carpet to be tucked over the strip. Cut any pieces shorter than full length prior to removing the paper backing. Gripper Edge is ready for installation and power stretching instantly.